John functions as the public persona of Choice Finance® within the business and government communities of the greater capital area. He is the engaged, visible business and civic partner that Choice Finance® prides itself on being and serves in a number of capacities within professional and grass roots organizations throughout D.C., MD and VA. Also known as the Condo King, John is very knowledgeable with condo financing in Maryland, Virginia, D.C., and Florida. When John first started his career with Choice Finance® as a loan officer, he brought over a decade of team building, marketing and large-scope project management skills. It is these skills that ultimately landed him in his current position and are the vanguard for growth going forward. John attended the University of Maryland at College Park and currently resides in Clarksburg, MD with his wife Jennifer. John looks forward to working with you, and finding you the loan program with the lowest rate that also meets your specific needs. - "So what's your rate?" Ruby Brooks of Long and Foster. Washington D.C. real estate, Bethesda, Chevy Chase, Columbia Maryland. Partner with a qualified Financial Advisor and Mortgage professional, and educate your employees. You will benefit more quickly and profoundly than you could ever imagine. According to an internal survey data from KPMG, offering financial education is �cheaper than matching contributions, and , in some cases it seems to be more effective at increasing both participation and contributions. and an increase in productivity, morale and retention. According to a survey conducted by the Cambridge Human Resources Group, the financial illiteracy of workers "is considered the most critical unaddressed work-place issue of our time." According to Dr. Tom Garman of Virginia Tech, 25-30% of workers report high work stress, and among the five major risk stressors (relationships, work, health, crime/violence, and personal finance), personal finance is rated by workers as the number one source of stress. U.S. Industries lose nearly $300 billion a year- or $7500 per worker- in employee absenteeism, diminished productivity, employee turnover and direct medical, legal and insurance fees related to workplace stress, according to the American Institute of Stress. Half of workers who do NOT contribute to their pension plans fail to because they have credit and money management issues. 25%- Number of participants in a 2003 survey that reported have no retirement account whatsoever. A poll of workers conducted early in 2006 by EAP provider ComPsych revealed that �52% of employees felt they were worse off financially in 2005 than they were in 2004, with 28% believing they were one setback away from financial disaster. My standard response to this query is, �What do you want it to be.� This is one instance where an �educated consumer� is NOT your best customer. In recent years, it seems everyone has purchased a primary residence, second home or investment property, refinanced or done a home equity loan for capital improvements in lieu of moving. 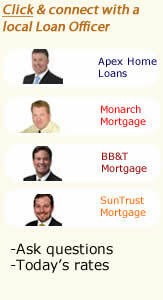 The results� an entire society of folks who are convinced they are Mortgage Professionals. What should you be asking? For starters, let�s consider YOUR situation and how you are representing it to your lender. Is your home REALLY going to appraise for what you think it should? Do you have any concept of what drives the value of your home beyond location? It�s not your pool, your new deck or how nicely you have it decorated. What is your credit situation? If you want to compare apples to apples with someone, you need to be prepared to put all of your �business� on the table. How do you know what someone else owes on their home, what is their loan to value, how much money do they have in the bank, what is their Debt to Income Ratio, how much qualifiable income the lender is able to use, and what are their credit scores? Without asking these pointed questions or affording this information to your family and friends, you cannot derive a fair comparison. What are your plans, your goals for yourself and your family? Do you plan to retire in this property? Do you plan to keep it as an investment property down the road? The days of someone handing their last payment to the mailman at the end of their 30 year mortgage period are all but gone. The average length of homeownership is less than 6 years in most metropolitan areas. Some benefits of homeownership include the appreciation and the tax deductibility. Did you know that if you are a disciplined homeowner, you can actually pay off an interest only loan more quickly than a fully amortized one making the exact same payments? Ask a Mortgage Professional how! Something we haven�t even discussed that is the most basic thing you need to consider is, �What can you afford?� With the high cost of real estate, it is important that the client gets into a mortgage payment that they feel they can afford. There are a tremendous amount of variables involved. It is also an emotional decision and one that should not be relegated to �what is your best rate?� If you are dealing with a true professional, they will want to talk to you about all of the things I have listed above and many that I haven�t. I really do understand the feeling one has with regards to protecting yourself and your best interests. We are ALL consumers and all have to deal with salespeople, commissioned employees and counselors/advisors at some point. My point is that you need to think this through, be open to suggestions and advice from true professionals and make an educated decision taking into consideration ALL of the factors that will affect you now and in years to come. For what it�s worth, those of us (like Choice Finance®) that are career Mortgage Professionals, enjoy and thrive on the education portion of the mortgage process. It is what we do. We are not �new to the game� and have built our client base through competent, sound advice. We will focus on exploration of your specific facts and a commit our highest level cf customer service. Depreciation for residential real property is computed over 27.5 years (straight line) and depreciation on commercial real property is computed over 39 years (straight line). Deferred like kind exchanges (Starker Exchanges) deadlines. Must identify new exchange property within 30 days of settlement of the old property and settle on new property within 180 days of settlement of old property. Qualified third party intermediary must be used. Remember, language expressing intent to conduct like kind exchange must be in contract for sale of old property. Reverse Starker�s (whereby new property is acquired before old property is given up) do not have specific time limits, provided that a third party intermediary is used. Investors who buy and �flip� properties may run into tax trouble if they do too many in any given year. The Internal Revenue Code contains a nasty little provision known as �dealer status�. Any individual who flips too many houses in one year could be deemed a dealer and not be eligible for capital gains rates or like kind exchanges. The profits are taxed as ordinary, earned income. This means that the profits are subject to self employment tax as well as ordinary income tax. There is no specific number mentioned in the code but it is a subjective test based on the number of transactions and the amount of rehab or fixing up involvement of the properties. Capital gains rate is normally 15%, less for low income individuals.